CFA welcomes Bridgette McCullough Alexander to our Board of Directors. She joins a growing, vibrant, creative and supportive group of people who shore up CFA and enrich our programs. I am genuinely happy and proud to be in their company. Bridgette joins Andrea Gambino, Margaret Newman, Jacqueline Stewart, Stephen Journey and myself on the Board of Directors. My friend and one of the first people I went to when starting this beast (the archive), Michelle Puetz joins our equally awesome Advisory Board. She joins Alison Cuddy, Charles Tepperman, David Huck, Amanda Robillard, Larry Zanger, Leslie Buchbinder, Scott Smith and Scott Baker…all who have donated significant helpings of their talents and skills. While processing the Chicago Academy of Sciences’ (Peggy Notebaert Nature Museum) collection, I came across an unfamiliar stock among some 1930s-40s home movies. Found on metal 100’ and 50’ spools sans box, the edge markings read “Kodacolor Safety Film” and dated from 1936. What struck me immediately was that not only were these “Kodacolor” films black and white, but displayed different physical properties than Kodak’s B&W reversal stock produced at the same time. 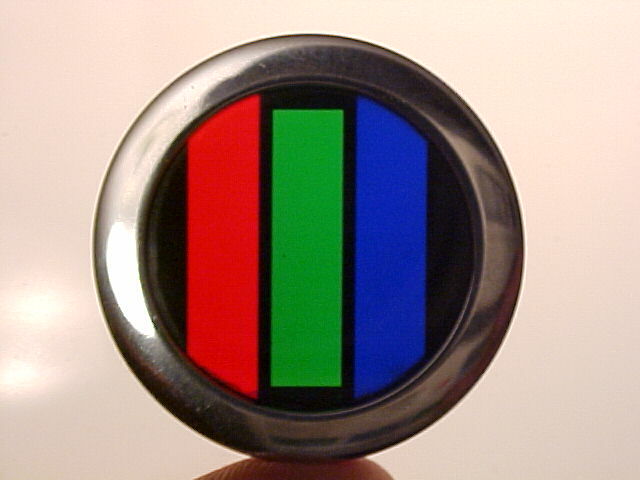 Under a loupe, the film appeared to have a large, pixel-like grain akin to standard definition video. Tilting the film over a light source revealed a shift in density similar to a Fresnel lens. Not typical black and white reversal, that’s for sure. I hopped on the computer and did some research on Kodacolor stock. While Kodak has used the Kodacolor trademark for a few products, the lesser-known 16mm Kodacolor was an early lenticular color stock. 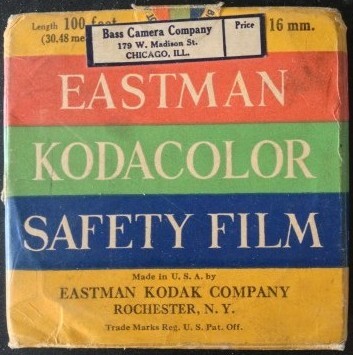 Introduced in 1926, Kodacolor was a means of giving amateur filmmakers access to color pictures before Kodachrome became commercially successful. The concept of Kodacolor’s lenticular system involved a special filter that separated light into red-green-blue as it entered the camera lens. The stock itself was panchromatic black & white, which meant it registered red, green, and blue light as opposed to orthochomatic’s only blue-green sensitivity (hence red-lit darkrooms for processing orthochromatic film). The film itself layered the emulsion away from the lens, behind a complex base composed of tiny lenses for splitting the light coming into the camera lens— think of television’s miniscule RGB components working to form a whole picture. The black & white film would then be projected through a RGB filter that would split the light back onto the screen, projecting a full-color image. Unfortunately, Kodacolor was plagued with inconveniences. The extremely slow film (modern day 0.5 ISO!) could only be shot in bright daylight to compensate for the light loss in both the camera’s filter and the projector’s filter. It goes without saying that the need for both filters was also cumbersome. Soon, Kodachrome’s subtractive color system proved more accessible (and assumingly more cost-effective), dominating the amateur motion picture market. Roughly ten years after its introduction, Kodacolor ceased manufacture. At the moment, we have no means of viewing the Kodacolor film at the archives in its intended color. A 1928 home movie in CFA’s Susan H. and Charles P. Schwartz Collection shows the defined grain of the lenticular stock when viewed without the Kodacolor filter. For the past few months we have been gathering information about the Chicago-based design firm Goldsholl Design & Film Associates for our upcoming program MEET MORT & MILLIE (Sunday, April 7th at the Chicago Cultural Center). Former employess of the firm turned out to be some of our best sources – Susan Keig, Wayne Boyer and last but not least, Larry Janiak. When speaking recently with Larry he decided CFA would be a good home for the prints and elements of three of his experimental films - DISINTEGRATION LINE #1 (DL1) (1960s), DISINTEGRATION LINE #2 (DL2) (1960s) and ADAM’S FILM (1963)…. And we couldn’t be more delighted! A Chicago native, Larry studied at the Institute of Design at I.I.T. and the Art Institute of Chicago. He worked for the Richard Kliedon Animation Studio in Chicago from 1956 to 1959 and was employed by Morton Goldsholl Design & Film Associates before and after being drafted into the U.S. Army from 1962 to 1964. Here, Janiak was a creative force in the design firm’s film department. 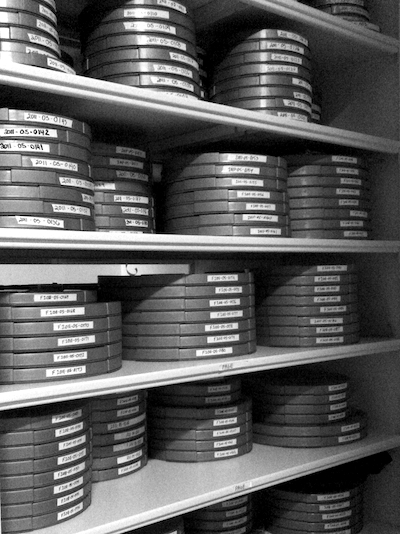 Now back to Janiak’s donated films: DL1 & DL2 are both direct animation films. DL1 (which is screening this Sunday at MEET MORT & MILLIE !!) is primarily black & white and silent, while DL2 is color with sound. Both films were made using the same technique- by applying lithographic blackout, or touche, to unprocessed black and white film stock and then shocking these strips of 16mm film into tanks of cold water, fixer, hot water, developer and then repeating the process. Janiak then carefully washed the remaining chemical residue off of the strips, hung them up to dry on his mother’s clothes line (!) and then arranged them into what he called “interesting sequences.” The back and forth chemical processing was repeated many times to build up an abstract and fully random pattern. For ADAM’S FILM (1963) Janiak mixed the chemically generated visual variations seen in DL1 & DL2 with live action footage of an early Chicago Earth Day parade and a Janiak family gathering, resulting in what Fred Camper describes as “an enigmatic combination of personal family images and dynamic shapes.” Cine-File Chicago‘s Doug McLaren goes further by stating, “Janiak displays an instinctive command of his techniques, an assuredness of process rivaled only by Pat O’Neill.” Larry just humbly refers to this film as a “sketch” shot on a 16mm camera that he had recently purchased from downtown Chicago’s Central Camera. 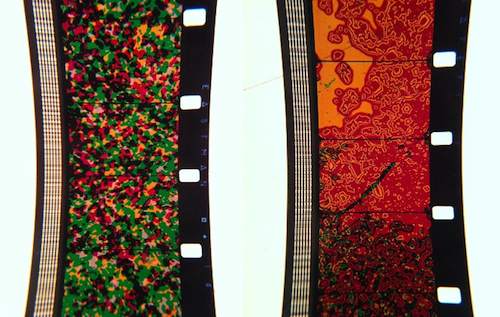 CFA is delighted to add these three films to our collections at 329 West 18th Street. Along with the 2011 donation of JoAnn Elam’s films, Janiak’s films add to our growing collection of locally produced experimental films. AND, DON’T FORGET. . . be sure to check out DISINTEGRATION LINE #1 on the big screen at this Sunday’s MEET MORT & MILLIE program !! For this year’s Out of the Vault program, MEET MORT & MILLIE, we’ve gathered an exciting batch of people to help shed light on the industrial films of Goldsoll Design & Film Associates. But before we get to our panelists, let’s first meet our moderator- Amy Beste! Amy recently authored a chapter on the Goldsholls in Chicago Makes Modern: How Creative Minds Changed Society, and deserves a ton of credit for spearheading our effort in what we like to call “Goldsholl outreach,” or re-introducing audiences to the work and films of Goldsoll Design & Film Associates. Amy is a recent PhD graduate of Northwestern University and the current director of public programming for the department of Film, Video & New Media at the School of the Art Institute of Chicago where she organizes the visiting artist series ‘Conversations at the Edge’ at the Gene Siskel Film Center. And now for our panelists (in no particular order). First up, Susan Keig. Susan Jackson Keig is an internationally recognized art designer in private practice, who at the current age of 94 (! 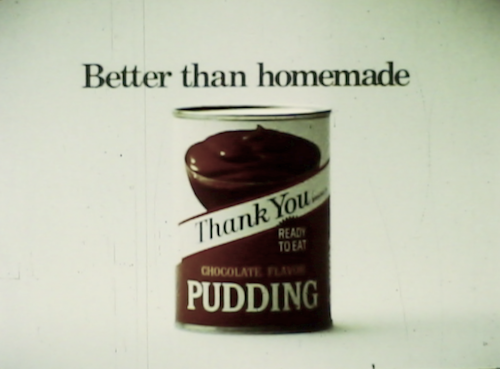 ), still manages her Chicago-based design practice. Susan once headed the Design Department at Goldsholl Design & Film Associates. Here, Susan worked for such clients as Lyons & Canahan, Scotts Foresman and Company, Evanston Hospital, Chicago Children’s Memorial Hospital and Simpson Lee Paper Company, among others. Some of her design projects include an LP record and album for Buckminster Fuller, a medallion from the Free Congress Foundation for Margaret Thatcher, and the Clare Booth Luce medallion from the Heritage Foundation for Ronald Reagan. 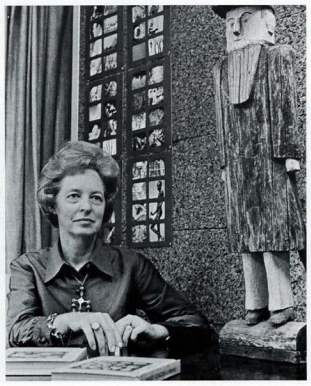 Along with her more commercially-oriented clients, she also worked with Audiobon wildlife sanctuary and with the restoration at Shakertown at Pleasant Hill, Kentucky in exploring the environment by design that was a lifestyle for Shakers (she’s also a leading authority on Shakers!). Susan is a Fellow and past-president of the Society of Typographic Arts/American Center for Design, and has lectured at Yale University, Heritage of the Arts SUNY and the School of the Art Institute of Chicago. She taught at the Institute of Design, Illinois Institute of Technology in Chicago, has had one-woman exhibits in Louisville and New York, and is a Distinguished Alumna of the UK College of Fine Arts. For many years, Boyer worked at Goldsholl Design & Film Associates where he worked closely with former ID classmate Larry Janiak (not sure why he’s not pictured above?!). 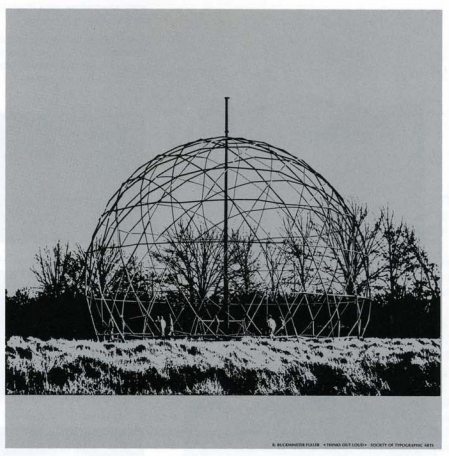 The two were encouraged to apply their ID experimentation of Bahaus ethos to the firm’s advertising and industrial films. At Goldsholl & Associates, Wayne worked with clients such as Kimberly Clark, Chicago & North Western Railway, Champion Papers, Karolton Envelope Company and Inland Steel Company, among others. Boyer is also known for his 1975 film The Building: Chicago Stock Exchange (1975), which we screened during our 2007 BIG PICTURE series. Our third and final panelist is Victor Margolin. Victor is Professor Emeritus of Design History at University of Illinois at Chicago and the first person in the United States to receive a PhD in design history. He began teaching Art & Design History at UIC in 1982 and soon after joined with small group of colleagues to found the academic design journal, Design Issues. Victor has written numerous articles on local design history, including an insightful look at African-American designer Tom Miller, who worked at Goldsholl Design & Film Associates for over thirty years (“African-American Designers in Chicago: Some Preliminary Findings,” AIGA Journal of Graphic Design 10 no. 1 (2000)). A wealth of his academic writings and personal musings can be found over on Victor’s website.